Yeah, I AM The Mom of the Year! Meredith Spidel blogs at The Mom of the Year, dedicatedly earning her title one epic parenting fail at a time. When her kids aren't busy pummeling each other with legos or requiring their 16th sippy cup refill of the day, she tries to offer quick, relatable laughs for fellow parents of the world and all their empathizers. She remains entirely terrified by crafts, promises to never share any useful household tips, and is fully committed to a less serious look at the world of parenting. Follow Meredith on Twitter, Facebook and Pinterest! I have two children. A 3 1/2 year old boy and a 1 1/2 year old girl. I had never originally planned to be a SAHM. I was working as a social worker and after I got pregnant, we sat down and punched the numbers for daycare. We realized my net earnings would be next to nothing. We also have no family close and my husband works long hours, so I would have to figure out a job that allowed me to do all the pick-ups, drop-offs, sick days, etc., so it would have been really hard. What powerful force or idea within pulled you into the blogosphere? I was going through a pretty eventful time. My daughter was just born, my grandmother had just passed, my sister got married, we had some financial issues, and my mom was dying. I had never considered starting a blog before, but one day something sort of snapped, if you will. I picked up my laptop and started writing. I believe God gave me this outlet to process what was going on around me, and it was wonderful! How long have you been blogging? Where do you want your blog to go? I have been blogging for almost a year and a half. I have no idea where I want it to go! I have been totally thrown by the amount of work it takes to keep up with it, but it has been such a huge blessing in so many ways. Many days it feels like a job, but there are also loads of moments that it is pure fun. I don't have more time to make it bigger or try to write for other outlets right now, so I think I will continue with it until I feel firmly called to stop. Or maybe in the future, more doors will open? I'm trying to just remain accepting of wherever it goes. What is your relationship to blogging? Is it more like how one feels about a Cheetos addiction or a yoga habit? I don't do yoga and I try not to let myself eat Cheetos, so I don't know! Somedays I love it, some days I hate it. I do believe it is something I am supposed to be doing right now, so I am trying hard to balance the time commitment with the rest of life and not get too swallowed up in it. I am so lame, I had to look up what this meant! Oh gosh, can I say every day? I 100% do NOT have a handle on this motherhood thing. I am the mother chasing after her shoeless screaming toddler in the preschool parking lot in the middle of winter. I like to say I earn my Mom of the Year title one epic parenting fail at a time. Most recently, when my son got into a tube of Vaseline when he was supposed to be napping and smeared it all over his hair, the bedding, and the carpet, I screamed, freaked out and told him that he had to get back in bed and not move while I cleaned it up or I was going to call the police. I though that was a pretty rockstar moment. You go into a Gap that has women's and kids clothes. Do you treat yourself or the kids? The kids. I'm a psycho bargain-hunter, and could never justify the prices unless something was actually NEEDED. My clothes might be so "last-year", but they still fit! 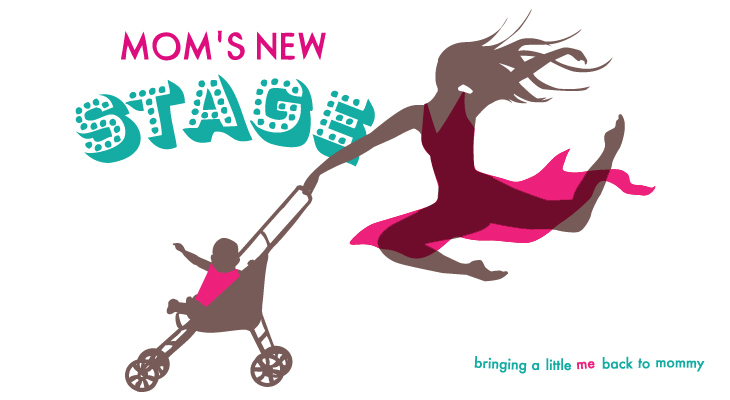 What would you like to change the most about your parenting style? I want to be calmer, more relaxed. I hate being this busy all the time! Speaking of guilty pleasures, what are a few of yours? Star magazine, Diet Coke, wine and pretending my son is napping so I can blog (thus the Vaseline incident). 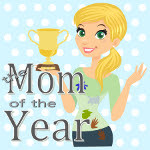 What advice would you give to mom bloggers? I am trying too hard to figure out balance, so I don't think I'm qualified to advise anyone! I do know that I keep trying to focus on what is really important in this life. I think that looks completely different for everyone, but I never want to look back on anything with regret, you know? Not that I know anything about this, but husbands often have mixed feelings about their wives' mom blogging. How is this issue in your family? My husband has been really awesome about supporting the blog. He does all of my site support, which I couldn't begin to do to save my life. He also reads my posts and listens to me talk about the blogging world ad nauseum. He knows who my blogging friends are by name, even he's never met them! I'm not saying he understands it, or doesn't get cranky when I am constantly checking in or stealing moments away to write, but he is supportive. Blogging is a hard thing to support because it takes so much time and there is very little financial return (at least for me!). I don't know if we could keep up the energy level of this for forever, but for right now, he gets that it is important to me. 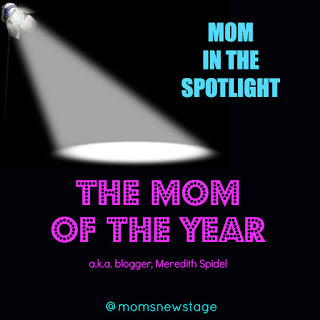 Wonderful interview and Meredith you know I could relate on more levels than one, especially with trying to find balance with the blogging world. It's so hard to figure out, isn't it, Janine? Thanks for reading! That is one of my favorite questions, since all bloggers are trying to find this miracle. I need a bloggy-godmother who shuts the laptop on your fingers if you get stuck in a bloggy black hole? Yes! Blogging is fun one moment & a "job" the next. And the balance...well, I'm still trying to figure out that one too! Great interview! Thanks so much, Kim! Meredith gave a fabulous interview. Now can we translate all this work into a six-figure career, pretty please? Great idea to interview moms, Keesha. Love it! Thank you, Kathy! Vaseline is bad, but at least it wasn't poop. I have heard of that. Talk about a bleach commercial! I found you through Meredith's blog, and I'm so excited to follow! I also love Meredith's answers. I've been blogging for about 5 years (my current blog is only 4 months old as I had to start over and go anonymous for work), and it DOES require a ton of work. I post once a week, because that's where I've found my balance lies. I do enjoy those who post more frequently, though, because I love to read blogs, too! Go you, Shay, for figuring out what your balance is. Smart for knowing what works for you and sticking to it. I so appreciate you following along and checking in! Thank you, Shay for visiting and commenting. I'm gonna say it, blogging can be an addiction. Sometimes it is healthy (constructive?) and sometimes not at all. I agree with Meredith - kudos to you for setting a limit that you can live with! Aw, thanks Lynn. And thanks for always checking in and supporting me! Here's to those guilty pleasures! Thank you for visiting, Lynn! Glad you liked Meredith's rockin' interview - she is talented, funny and a good spirit. YAY for a Meredith interview! This right here is why so many people love you; you're so HONEST! Admitting that you don't know what FML means--I just love you :) Great finding another blog, too! Thanks, Keesha and Meredith! "...I screamed, freaked out and told him that he had to get back in bed and not move while I cleaned it up or I was going to call the police." <<-- This is one of the funniest things I've read all week!!!! Hilarious! Thanks to both of you for sharing this!! !